Now you can customize your wedding without the high cost! It’s no surprise that technology has found its way into the wedding industry. Like with everything else tech, automation and digital wedding planning has its perks! The newest tech advances can bring down the cost of a wedding and save time. Plus, many of the details can be customized. You no longer have to live with off-the-shelf accoutrements. Even for those who aren’t on a budget, high tech weddings are becoming more popular each year. 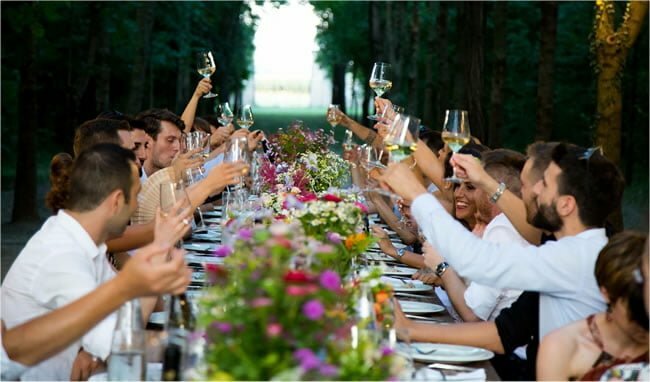 Here are some of the latest high tech innovations in the world of weddings and how you might incorporate them into your planning! It’s no secret that wedding gown shopping is one of the most overwhelming decisions a bride can make. But thanks to a new app, Wedding Dress Studio, choosing a wedding dress couldn’t be easier. You’ll get to see different silhouettes, styles and fabrics so you can try on different options virtually before stepping foot into a store. The app is designed to help narrow down the perfect choices. The images are simulated dresses that have similar real-life counterparts. The benefits of using this app before the first consultation are plentiful, such as less pressure to make a decision on the spot, plenty of time to review the options and the elimination of frustration with your mother or whomever thinks they know best. Worried about the expense of reception decorations? Wedding projectors are clever devices that can set whatever mood you like and are extremely cost-effective to rent. A preprogrammed projection can create a beautiful environment without having to spend a small fortune on flowers, special lighting like projected chandeliers that later change to disco balls. Some of our favorite uses: project your new last name, photos of your love story or you can even project flowers all around the room! Fairy lights are extremely popular. Projectors allow you to create any decor you want, and with the added bonus of less cleanup at the end of the night. Thinking about designing a custom wedding ring? 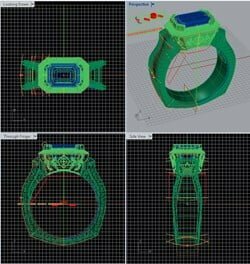 3D computer modeling and printing allows couples to create a custom designed ring entirely from scratch. You will get a 3D computer model rendering that shows the design from every angle before it is produced. Practically speaking, you’ll be making an investment that will be around long after your wedding day so it needs to be perfect. 3D design and printing technology ensures that your design will be unique down to the last detail. Many couples are thrilled to be able to use their family’s heirloom engagement ring, but worry about how to find a wedding band that pairs with it perfectly. A custom designed band paired with a precious and sentimental family ring will look like a matched set that belongs together forever. 3D modeling can save your vision and avoid disappointment. By now everyone’s heard of 3D printers. They are truly amazing. 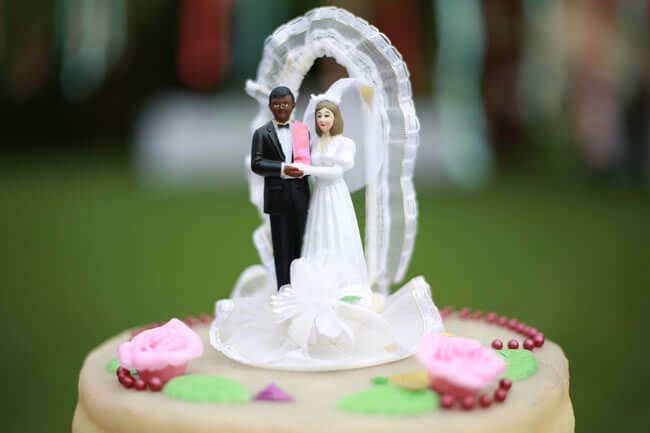 One of the newest ways to use 3D printing is to customize your wedding cake topper. All you have to do is supply photos of the couple and perfect replications to a 3D modeler. Before you know it a replica of the bride and groom will be created to a perfectly proportional size for your cake. Some 3D modelers are so good, that even the bride’s dress can be replicated. What a lovely keepsake! Make one for each table embedded into the flower arrangements. There’s so much more. 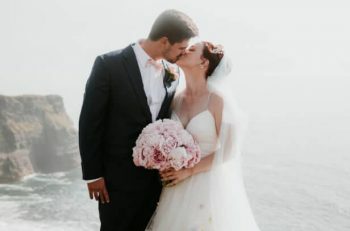 Live stream your ceremony and reception to friends and relatives who couldn’t be there. Use a photography drone or GoPro to snap shots that truly capture the moment. Or if you’re feeling like being a techy yourself, try using a wedding veil viewcam. And don’t forget to create your own personalized couple hashtag! Elevate your happy ending to the next level with the latest in technology. These are just a few of the new high tech ways you will be able to create long lasting memories. The memories… ah, the memories! All photos are from Pixabay.com and are free for commercial use. No attribution required. The illustration is from Krikawa.com and no attribution is required. Previous article One aspect of wedding shopping is jewellery and accessories! Next article Travelling to India to Attend a Traditional Indian Wedding?